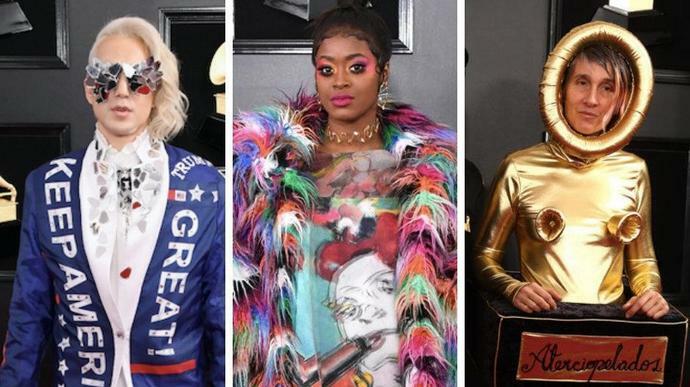 The 2019 Grammy Awards red carpet had multiple MAGA moments and more than a few fashion faux pas on Sunday night at the Staples Center in Los Angeles. Singer and notorious red carpet troll Joy Villa showed up in a border wall-inspired dress, complete with a "Make America Great Again" purse and barbed wire-like material on her shoulders. Singer Ricky Rebel, another supporter of President Donald Trump, turned heads with a reversible white-to-blue sequined jacket that sported the words "Trump," "2020" and "Keep America Great!" He paired the mirrored jacket with matching sunglasses, white pants and calf-length, heeled white boots. Rebel explained that he wore the jacket to promote his latest album, "The New Alpha." "I wanted to wear something that represented what an alpha is and who an alpha is and I am the new alpha," Rebel told Entertainment Tonight. "And I'm reflecting millions of Americans out there who voted for Trump. Keep America great. That's right, baby. We are here. We're here all around the world, 50 million of us."